It is easy to believe that nothing interesting happens when you reach the end of the tube line, however, that is certainly not the case with Walthamstow. Nestled away in this leafy spot of North East London, lies the electric neon wonderland, otherwise known as Gods Own Junkyard. 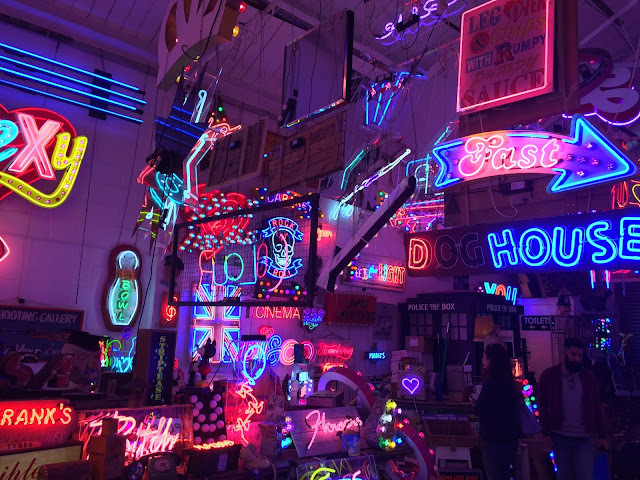 The biggest collection of neon lights outside the USA, is housed in a large warehouse on the Ravenswood Industrial Estate and belongs to the family of the late Chris Bracey. Chris Bracey designed many of the iconic neon signs found in Soho and grew to become a successful artist. His work has appeared in many feature films including 'Eyes Wide Shut', 'Charlie and The Chocolate Factory' and 'Batman' and has also appeared in a Vogue Magazine cover shoot. Gods Own Junkyard is a kitsch paradise. Eyes are met with a tidal wave of Technicolor as they search, unsuccessfully for a surface that is yet to be filled with neon. Pepto Bismol pink love hearts flicker in the neon haze, asking guests the question: 'Are you getting enough', whilst giant disco balls decorate the floor. For those interested in taking some neon home, prices start at around £350 for a small installation and can reach up to the thousands. It is the perfect place to while away the hours over the weekend and they have a café too making it easier to take in the vast expanse of neon.